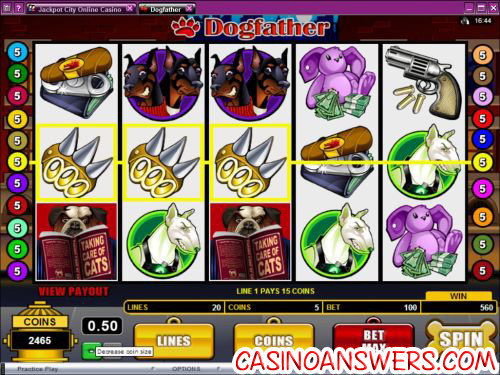 Dogfather Video Slot Guide & Review - Casino Answers! Dogfather is a 5-reel, 20-line video slot from Microgaming. It features wild symbols, two scatter symbols, free spins and a bonus game. You can play Dogfather at All Slots Casino or King Neptunes Casino.Play at this years #1 online casino for United States - Slots.LV. By many measures, dogs are the most popular pets in the world. Most dog owners love their dogs so much that they consider their dog to be part of their family. The Dogfather video slot is a look at what it would be like if the dogs had a family of their own. The Dogfather video slot’s theme is a parody of The Godfather – a mafia made up of dogs. The Dogfather himself is a bulldog in a suit smoking a cigar. If you hit 5 Dogfathers, you will win the top jackpot of 13,000. He is the wild symbol and he will substitute for all symbols except the scatter and bonus symbols. When a Dogfather symbol completes a winning combination, his symbol will become animated. You will see him reading a book called “Taking Care of Cats” and cleverly chuckling. Coin values in Dogfather are $0.01, $0.02, $0.05, $0.10, $0.20, $0.25 and $0.50. Next, you must decide how many coins you wish to bet (up to 5 coins). You may also select the number of lines you wish to play. Using the “Bet Max” button will spin the reels using 5 coins at whichever coin value you choose and all 20 paylines active. If you are betting conservatively, we recommend you keep your coin value low and play all 5 coins. The lowest bet you can make on all 20 paylines is $0.20 per spin, while the highest is $50 per spin. If you hit 3, 4 or 5 Itchy da Flea scatter symbols anywhere on the reels, you will win 13 free spins with a 3X multiplier. An animation of Itchy da Flea will be shown, with a target zooming into his eye. Jazz music will play along with the free spins. A grand total of your free spins win will be shown at the top of the screen along with the number of free spins you have remaining. Bonus wins will not be tripled. Free spins can be retriggered during the free spins feature. Scatter wins will be added to payline wins. All bets and lines played are the same as the game that triggered the free spins. 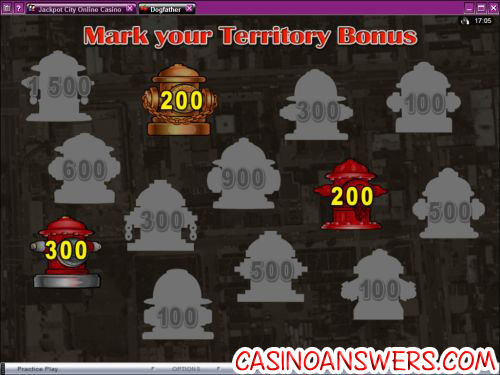 If 3, 4 or 5 hydrant scatter symbols appear anywhere on the reels, you will trigger the Mark Your Territory bonus game. You will be taken to a screen with 13 fire hydrants and you must choose 3. Once you click on a fire hydrant, the prize will be revealed to you. Once you have chosen your three fire hydrants, the rest of the prizes will be shown. The bonus game can be triggered during the free spin feature. Bonus wins will be added to payline wins. Wins shown in the bonus game have already been multiplied by the total bet. Dogfather is a video slot with a sense of humour. This makes it a great video slot for casual and low stakes casino players. Of course, dog owners will love playing the game as well. You can find the Dogfather video slot at any Microgaming casino, but if you want our recommendation, you’ll want to go with All Slots Casino for a 100% up to $200 signup bonus plus an extra 10% on each deposit! Are there any US-friendly casinos that have Dogfather available to play? Microgaming casinos are currently not accepting players from the United States. However, you can still play all of the fun video slots at RTG casinos like Rushmore Casino. If you sign up at Rushmore Casino, you can get a 100% bonus up to $800 over your first two deposits. Does the Dogfather video slot have a progressive jackpot? Dogfather doesn’t have a progressive jackpot, but it does have an impressive top jackpot of 13,000 coins! Is there a godfather slot machine? Where can I play the dogfather slot machine?